The Challenger Deep is the deepest known part of the ocean, lying in the Mariana Trench (a subduction zone feature) near Guam. The Mariana Trench is a 1600 mile-long, 43 miles across, formed by subduction of the Pacific Plate under the Mariana Plate. It has only been visited once before by humans when Navy Lieutenant Don Walsh and the Swiss explorer (deceased) Jackques Piccard rode in their submersible, Trieste, to its bottom. In their descent, the outer layer of their porthole cracked when they were about five miles down, and still a mile above their destination. The Triest was the first wholly self-contained submarine to make the venture. It was a giant, cigar-shaped "balloon" filled with 22,500 gallons of petrol--which is lighter than water--to provide buoyancy. Beneath this ballon was a tiny steel sphere, 7 feet in diameter, holding the two adventurers. It had nine-tons of iron pellets attached to make it sink. These were then jettisoned on the ocean floor. There is apparently a high-competitive race going on between Cameron, who has been preparing for this rather secretly for five years, and Richard Branson, who has built an airplane-shaped Virgin Oceanic submarine. The third competitor is Patrick Lahey, the president of a small Central Florida company, Triton Submarines. Cameron's submersible is being built by Australian engineers, and the goal is to film in 3D at the bottom. Why the race? $10,000,000 will be awarded by the X-Prize Foundation, a nonprofit organization that aims to inspire radical breakthroughs that will benefit humanity. 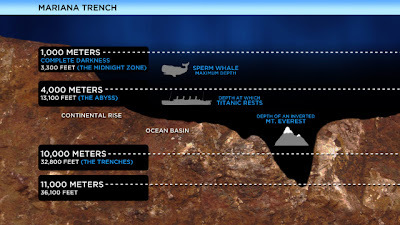 The Deep is 35,814 feet below the ocean surface, a mile deeper than Everest is high. What's so exciting about the Challenger Deep? For biologists, it's the possibility of documenting some of the estimated 750,000 species of marine life that we haven't found yet (and this excludes the billion estimated unidentified microbes). According to a 2010 article in the DailyMail.co.uk, Cameron plans to film parts of an Avatar sequel down there. Let's hope that he's successful! 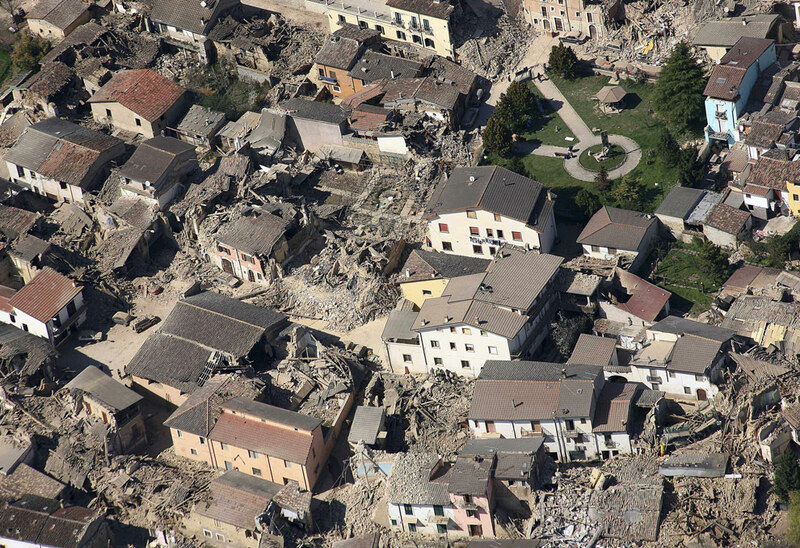 Last fall, six Italian seismologists and one government official were accused of manslaughter involving victims who perished in the 2009 earthquake that devastated the city of L'Aquila, killing 309 people. The scientists were members of a government advisory body, the National Commission for the Forecast and Prevention of Major Risks. The prosecutor of L'Aquila contended that they had falsely reassured the public about the likelihood of the earthquake. The prosecutor acknowledged that earthquakes cannot be predicted, but he accused the scientists of misrepresenting the scientific uncertainty. The accusation focuses particularly on the government official, Bernardo De Bernardinis, at the time the deputy technical head of Italy's Civil Protection Agency, quoting him as saying "The scientific community tells me there is no danger because there is an ongoing discharge of energy. The situation looks favorable." The scientists had been called to a meeting that had been charged with assessing the risk of increased seismic activity in the area. The scientists contended from the beginning that they did not make such statements, and have pointed out that that particular statement does not appear in the minutes of the meeting. The trial is scheduled for February 8, 2012, a few days from now. In a new development, a wiretap revealed by the Italian newspaper La Repubblica, quotes a conversation on the day before (or week before?? **) the meeting between Guido Bertolaso, then head of the Civil Protection, and Daniela Stati, an officer in the L'Aquila Provincial Administration. Bertolaso says "I will send them [the seismologists now on trial] there mostly as a media move. They are the best experts in Italy, and they will say that it is better to have a hundred shocks at 4 Richter than silence, because a hundred shocks release energy, so that there will never be the big one." If this wire tap conversation indicates that the Civil Protection had already decided the outcome before the meeting, the scientists may have good support for their argument that they never had a chance to make a serious risk assessment during the meeting. Bertolaso has been scheduled to appear as a witness during the trial on February 8. He is now under investigation and it is possible that he will also be charged with manslaughter, though whether or not he will be included in the on-going trial or in a separate new trial is uncertain. The trial of the scientists and De Bernardinis began last fall, has nearly 300 witnesses, and is likely to last through much of 2012. Scientists involved with risk assessment are very concerned about the issues here and more than 5000, myself included, signed a letter, which you can read here, sent to President Giorgia Napolitano through the American Association for the Advancement of Science. 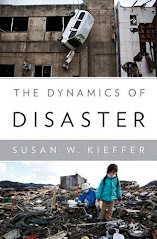 At the time of the letter, it appeared that the scientists were being charged with failure to predict the earthquake, not the current charges of misleading the public about the hazard. It is a very complex case. **It's very interesting that the Nature report and the Science report, both issued on January 26, have somewhat different facts and dates. More information about the situation last fall is here. The Nature site about the wiretap development is here, and the Science article is here. The Science article has an inconsistency about whether the call was a week or just a day before the meeting. Heavy snow and bone-chilling cold weather are holding central and eastern Europe in their grip. Countries not used to such weather are struggling with power and traffic issues: Serbia, Ukraine, Poland, Bulgaria, Turkey, Romania. The cold is hitting the U.K. today. The Met Office in the U.K. has issued a Level 2 alert that there is a 100% probability of severe cold weather between Thursday and Sunday, with temperatures dipping as low as -6 to -10 Celsius. Their alert levels depend on three thresholds: mean temperatures below 2 C for 48 hours or longer, heavy snow, widespread ice. Only one of the three needs to occur before an alert is issued. A level three alert means prolonged periods of cold weather, and triggers some specific actions by social and healthcare services to target high-risk groups. The highest level, 4, means that the weather is so severe that even the healthy could suffer adverse effects and that the effects are so broad that they extend outside the health and social care system. The Met forecast for Belgrade, for example is for a maximum temperature of -10 C and a minimum of -12 C today and tonight. Things then "warm up" to negative single digits through Monday. Bucharest is even colder, at -12 to -14 today, and -7 to -10 tomorrow. "Europe is in a deep freeze indeed but I am somewhat puzzled by these temperatures given in this article. -10 C is really nothing unusual in eastern part of continental Europe. Right now temperature in Estonia where I live is near -30 and Estonia is not the coldest country here. Our climate is influenced by the Baltic Sea which makes it wetter and warmer. Russia, Ukraine, and Poland are in large part more continental climatically and suffer usually even more despite being located in more southerly latitudes (except parts of Russia of course)." I (SWK) can explain what happened, and how it sometimes goes with blogging. I started the post this morning, and then went searching on the WWW for a reliable meteorological source (I try to do that whenever possible rather than relying on news reports or "soft" sources.) In so doing, I went to the U.K. Met Office, got distracted with the forecasts for Britain, and forgot to get back to central Europe before leaving for my "real job" at work! Apologies to those freezing there--Stay Warm! On top of everything else, another not-uncommon blogging problem hit while I was inserting this addition--I hit the wrong key and deleted everything that I had typed up to this point. So, I'm going to post this before anything else goes wrong! 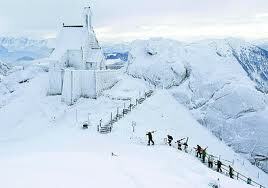 At least 150 people have died in Europe as a result of this deep freeze in countries spanning from Italy to the Ukraine. Temperatures plunged to -32 C (-25.6 F) in Poland overnight. In Ukraine, tens of thousands of people are in shelters. Last year was one of the coldest winters on record in Britain, and it was linked to the strong La Nina in place at the time. La Nina returned again last fall, and the Met Office predicted another cold winter this year, going so far as to suggest that Britain could face decades of bitter winters and return to a "Little Ice Age." This is based on observations of the sun that show that the UV output up to five times more variable than previously thought. The sun had been in one of its quietest phases of the 11-year cycle until this year, and during this time there were three years when the UK and northern Europe experienced unusually cold conditions, with warmer weather in the southern parts of those areas, around the Mediterranean, and north in Canada and Greenland. Although a number of papers have shown the correlation of low sunspot activity with cold weather in Europe, a mechanism has been lacking. The proposal here is that UV is absorbed in the stratosphere by ozone, so that in quiet parts of the sun cycle there is less UV to absorb and the stratosphere stays cooler. The effects from this "percolate" down through the atmosphere, affecting the jet stream above Europe, North America and Russia. The significant change is that air flow from west to east is reduced, which allows colder air into the UK and northern Europe. A significant result from this research is that the Little Ice Age, often attributed to climate change phenomena, was due, rather, to changes in the solar output that redistributed the temperatures around the north Atlantic but that, on average over the whole earth, the climate was constant. Here is a news release about this issue, and here is the original article in Nature Geoscience. The news release spawned considerable discussion of weather vs. climate that you can find here.